Is it just me or does it really seem like time moves at a faster pace, after you pass 40? For those of you who haven’t reached and waved goodbye to that particular milestone and beyond, trust me, it really does….It’s already the weekend again and last week is one big blur of 14-16 hour days and not as much accomplished as I had hoped. I did manage to write a letter to our local paper about one of my all time particular pet PEEVES, that being the flu shot. Michelle, are you reading this!!! If you weren’t reading Veggies…during last year’s flu season, when I was also ranting touching on this topic, I am definitely against this annual ‘ounce of (in my opinion, misguided) prevention’. What are your thoughts on the flu shot? It certainly is a topic that stirs up the discussion/dander and continues to do so…. On to a much more fun topic….. 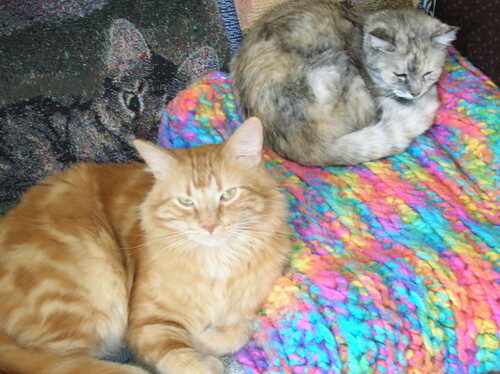 The ‘kid’s’ are continuing to make progress, at least they seem to be BUT only when it’s nap time and Ms. Mitz is sleepy and Mr. Cheddar comes a callin’ ! Now at least they can be on the same sofa without a snarling/hissing match insuing. I’ve been trying to find a nice men’s hat pattern to make for Joe, knit or crochet but the ones I’ve tried so far have either been waaaaaaaay too small (and Joe does NOT have a big head LOL) or just plain goofey. So, I’m giving it a go, trying to design my own toque pattern. I’ll let you know how that works out. Any other pattern designers out there? I think it’s so cool to design anything from scratch, what an accomplishment it is! Speaking of designing, I guess recipes qualify too, don’t they? It’s been great to ‘fire up’ the oven again and spend more time in the kitchen, now that the intense heat of summer is truly over, amen to that. It was record-breaking temps. here in BC this July and August, day after day over 30C, waaaaaaaaaaaaaaaaaaaaaaaaaaaay too hot for me and certainly much in the way of cooking (food that is!!!) was out of the question. Made one of my fav. 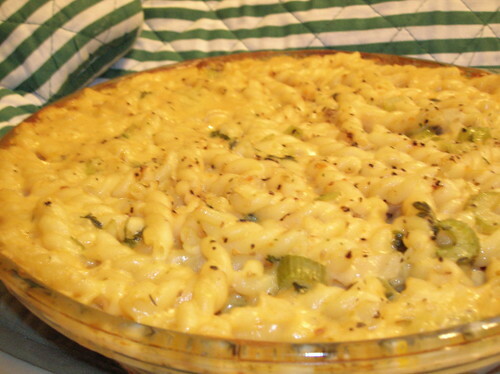 comfort recipes this week, Mac and Cheese with a Twist. Simple and delish… I’ll include the recipe at the end of this post. Aaaahh…the simple yet special things in life….. Speaking of which, can we ever have enough of the simple pleasures, in all forms? These seem more meaningful and precious to me as time goes by. *A beautiful fresh untouched snowfall and being able to take a walk in it, before anyone else, preferably with someone you love (for me, that’s Joe). *Memories of good times and people to be cherished (and so many days now my thoughts of these are with my beautiful mom…shopping together, going out for lunch, working on a sewing or craft project together, or just sharing a really good laugh). My way of getting through the loss of her not being here. *Reading something that is truly inspiring and beautifully written. * A song that touches the heart and conjures up a special day/night. * Waking up to the smell of fresh-brewed coffee. What are some of your ‘simple’ pleasures? And with November 11th tomorrow, it truly is a time to savor and appreciate all we have. To honor and never forget all those brave people who have fought in too many wars, in so many places and gave so much. We will be attending the Memorial Service here tomorrow. I will sign off with a favorite poem and wish you all a wonderful week. Delicious, satisfying and oh so good. Serve with stewed tomatoes or salsa to top this satisfying ‘comfort food’ entrée. You’ll never settle for KD again!!!! In a large cooking pot, cook the pasta in a large quantity of boiling salted water until tender, about 10 minutes. Drain thoroughly and set aside. Preheat oven to 350. Grease a large (8C.) casserole dish and set aside. In the same cooking pot (saves on dishes) that pasta was cooked in, melt butter over medium heat. Add the diced onions, green or red pepper and celery and sauté for 5 minutes. Reduce heat to low, add flour and stir to coat vegetables. Add the milk, mushroom soup and mustard, continuing to stir until sauce is smooth and thickened. Add cheese and continue to stir until cheese is melted. Remove from heat. Combine the pasta, parsley and seasonings with the sauce. Pour into prepared casserole dish. Cover and bake for 40 minutes. Remove lid from casserole for last 5 minutes of baking time. Recipe adapted from: Not Just for Vegetarians by Geraldine Hartman. All rights reserved. Oh, how I love Mac ‘n Cheese! I haven’t had it in a while, though. I should add it to the list of things that I need to make at some point here. I held off on getting the flu shot for years and years. But I now need to get one due to possible health issues that might result from another flu bout. I put a great deal of thought into it and decided that it was going to be the best choice for me at this stage of life. I’m exposed to a lot of yuckies through the schools and, if nothing else, I don’t want to be responsible for passing the flu on to kids. But, I know that it isn’t the best choice for everyone and I really do respect everyone’s right to do what works best for them. Yum, the celery is very interesting for mac & cheese. Haven’t ever tried that before. No flu shot for me, thanks. I wish my folks didn’t get them but I guess they believe the hype. As for your “kids,” believe me you’re privileged that they are that close together! Only in my dreams will I ever see Simba & Scout that close together. G., both emails I have for you are bouncing back. Can you email me and let me know what your email is? Ahh, yes I remember your flu rant in fact I ranted about it this summer and I thought of you. My brain is fogged at the momemnt, not sure why, but I’ll be stopping through again to chat about this topic. Your furbabies look comfortable. It makes me want to curl up beside them for a snooze. Do they purr when sleeping? My cat Veba used to. I found the sound soothing. 🙂 It’s great to see you posting again. You were missed. Good to see the two kitties sitting together, tho’ I wonder how amenable Mitz is…has she just resigned herself to her new housemate? (that’s certainly been the case with my CC – she knows there’s no other option, The Meezer’s here to stay…but she surely doesn’t like it). No studies have conclusively proven that flu shots prevent flu-related deaths among the elderly, according to the review, and some of the support for this practice is based on flawed data. …did you know that the influenza virus continually changes, and the strain causing most of the disease this year may be different enough from the one last year that the vaccine for one will not be effective against the other? A lot of guesswork goes into formulating the vaccine for the next “flu season”; sometimes the guessing is pretty accurate, sometimes it’s not. Effectiveness of the vaccine varies from year to year. And of course there are dangers and side effects, which can be seen on this CDC page. Yet, many people are not aware of the real facts behind flu shots — and their potential ineffectiveness, side effects, and harmful additives. •	A study in The Lancet found that even among people for whom the vaccine is most recommended (the elderly), protection can be as low as 30 percent. Nope, I won’t be getting any flu shots, either……M. Hi Caroline,Celery, green pepper and a big spoonful of Dijon….these are the ingredients of a special M and C!!! Glad to hear you are not getting a flu shot, too bad about your parents, maybe some info. on the topic (the NewsTarget article?) might give them reason to reconsider? Hi Opal, Nice of you to stop by. I missed all my fav blogs (incl. yours) while I was away. Yes, the ‘babies’ are so precious, great purrers (word?? )…both of them, when so inclined. Hi Sallee, Resigned is the word! The Mitz is not pals with Mr. C, by any means, I don’t know if that will ever happen. Im just glad they are able to ‘hang out’ a bit together now, its a real improvement. All my past cats got along famously, including Mitz with them, don’t know why she’s taken a dislike to Mr. C, he is such a sweetie!!! Hi Michelle, LOL…voodoo eh?? Im not sure what I would classify flu shots as. I know its a billion dollar industry for the drug companies among other things. Speaking of voodoo, have any of you ever seen the movie, ‘Voodoo Island’? If you need a real laugh, this might be the ticket. Corny and hilarious, it is!!! Oooh that mac and cheese looks divine! I cant wait to try it! I’m glad to see that your cats are getting along better! I’ve been working on a hat pattern, too. I like hats where the design goes all the way to the top of the hat, so I’m trying to incorporate that into mine. I’m on the third iteration of my pattern and I still don’t have it quite right. 🙂 I’m looking forward to seeing your finished project! Hi Beth, Glad you could stop by. I’m on my third try too for the hat for Joe, giving it another go today. THis will be all rib (2×2 or 3×3 I think, I like chunky rib) . Thanks for posting In Flanders Fields and remembering our veterans! Oh mac and cheese is a favorite of mine! Yum!! My two cats don’t really like each other either but I haven’t given up hope yet. They will sit near each other but not too close or one of them will take off.